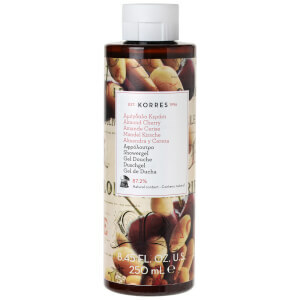 Experience a nourishing cleanse with KORRES Almond Cherry Shower Gel. Working to lift away impurities whilst intensely hydrating, the shower gel's moisturising properties make it ideal for every day, and its dose of wheat proteins create a protective shield on skin to maintain normal hydration levels. Skin feels clean and deeply nourished. Aqua (Water/Eau), Caprylic/Capric Triglyceride, Prunus Amygdalus Dulcis (Sweet Almond) Oil, Glycerin, Hydrogenated Polydecene, Glyceryl Stearate Citrate, Ammonium Acryloyldimethyltaurate/Vp Copolymer, Butyrospermum Parkii (Shea Butter), Decyl Cocoate, Aloe Barbadensis Leaf Juice, Althaea Officinalis Root Extract, Butylphenyl Methylpropional, Caprylyl Glycol, Citral, Citronellol, Coumarin, Distarch Phosphate, Glycine Soja (Soybean) Oil, Helichrysum Arenarium Flower Extract, Hexyl Cinnamal, Limonene, Linalool, Magnesium Pca, Manganese Pca, Panthenol, Parfum (Fragrance), Phenoxyethanol, Rosmarinus Officinalis (Rosemary) Leaf Extract, Sodium Gluceptate, Sodium Pca, Zinc Pca.